I can't believe Christmas is over. I don't want it to be. In fact, I'm dreading taking down all of my Christmas decorations. My house always seems so sad once it's gone. I realized I haven't shared this year's holiday decor with you. Better late than never, right? This was my very first year using real greenery. 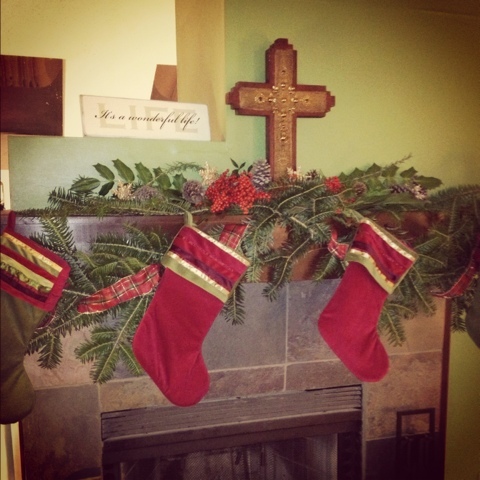 I made my own garland, wreaths, and we bought a real tree. In years past, we have always used fake stuff. While there are pros for both real and fake, I have to say - I don't want to go back to the faux stuff. The real stuff smells so good and looks so much better. Hubs' grandparents live on a farm minutes away from us. They used to farm Christmas trees. Now some of the trees are huge - I seriously think Macy's should come and look at a few of them for next year's tree lighting - So fun! The first week in December, they let me come over take some clippings. It was fun to ride around with them and find all of the goodies we used in decorating. My mantle is made out of a hybrid tree called Dixie Pine. I couldn't believe how easy it was to make the garland. It only took about 30 minutes to string it together. 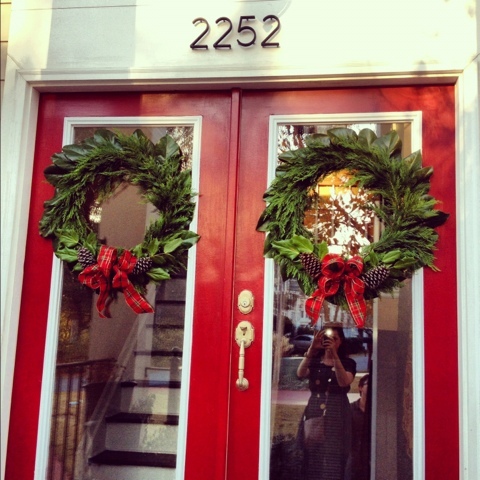 The wreaths took a LOT longer to do, but I really loved how they turned out. I used 4 different types of clippings to make these bad boys. I am going to miss these for sure... but they are looking pretty brown now, it's time for them to go. 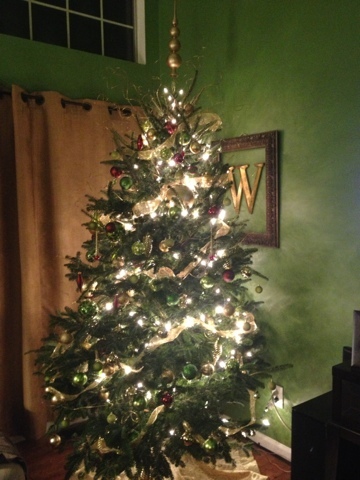 And here is our tree. I love it. I used the same ornaments from last year, but they look so different on a real tree. I love just gazing at it. Are you ready to take down your Christmas decorations? OR are you like me and are waiting to the last minute to part with them? Stay tuned - I'm working on a 2012 recap! Talk soon, friends! Your decorations are so pretty! I agree that the fresh greens just add a special touch with their smell and fullness. Next year, I too, will be using more live greens in decor. We have almost all our decorations down this evening and tomorrow will finish it off.